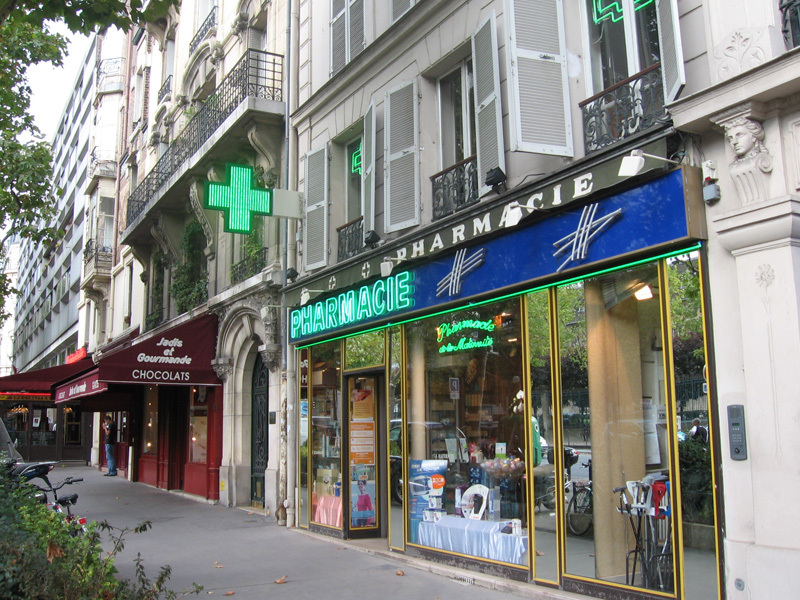 It's very useful to get acquainted with pharmacies in Paris; they're quite a bit different from pharmacies in the US, but they can really come in handy. I've had so many American visitors in Paris say to me as we're walking around, "I'm just going to pop into this pharmacy up ahead and get [batteries for my camera]/[a bottle of water]/[a pair of cheap sunglasses]/[etc]." Pharmacies in France do not have this stuff! They just have pharmacy stuff, i.e. medicine and whatnot. Go figure! Pharmacies in Paris are very easy to spot. They all have a big flashing neon cross (like a plus sign) out front, always bright green, often with some blue in it. Seriously, put yourself on any corner in Paris and look around, and you'll almost definitely see a flashing green pharmacy sign. One important way that pharmacies in France differ from those in the US is that the pharmacist on duty has the training and authority to diagnose minor ailments and prescribe some medications as needed. Pharmacists in France are highly trained and often speak very good English, so if you're on vacation and feeling sick — food poisoning, allergies, migraine, sunburn, sprained ankle, etc — often a pharmacist will be able to help. It's normal to discuss your symptoms with the pharmacist and have them give you something right away. Go on in and ask! Of course, if you're experiencing a serious health problem, the pharmacist is going to advise you to go to the hospital. Most pharmacies in Paris close relatively early; somewhere around 7 or 8pm, but there are a few that are open 24 hours. If have specific health concerns or are just the worrying type, find out about a 24-hour pharmacy that's near your hotel before you get to Paris, or ask the front desk at your hotel and keep the address handy. Couldn't hurt! So, let me reiterate: pharmacies in France do not have gum, cigarettes, umbrellas, drinks, snacks, magazines, most toiletries, greeting cards, batteries, a bottle opener, headphones, etc. They DO have medicine (both over the counter and prescription), sunblock, vitamins, condoms, sometimes cosmetics, etc. If French pharmacies don't have all that stuff you can find at normal American drugstores (like batteries and drinks), where can you get those? Monoprix is a big chain store that has all of these things; look them up and you'll find one near you. 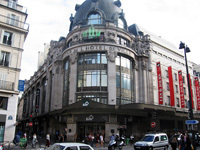 BHV is a big department store in central Paris that has everything. 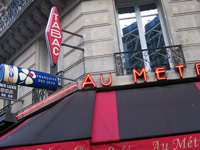 The tabac (tobacco shop, or tobacco counter in a bar) is the place to get smokes; these are always indicated with a red diamond-shaped sign. In residential neighborhoods you can find dollar-store-type stores that carry a lot of little conveniences like batteries and umbrellas. Souvenir stores serve as a good last resort; they have a lot of convenient stuff but will be very overpriced.